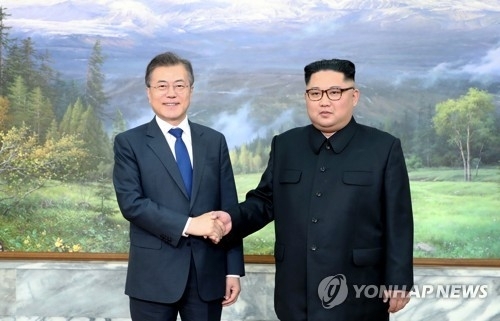 SEOUL, May 27 (Yonhap) -- The frenetic diplomacy over a historic summit between the United States and North Korea for the past few days shone the spotlight on the middleman role of President Moon Jae-in, who emphasized that only direct dialogue and mutual trust between the leaders of the two countries can solve the nuclear standoff. "Chairman Kim Jong-un once again clearly affirmed that his commitment to complete denuclearization remains firm yesterday," Moon told a press conference Sunday, one day after he and Kim held their second summit in a month at the border village of Panmunjom. "What remains uncertain to Chairman Kim Jong-un is whether he can trust the U.S. promise to end their hostile relationship and guarantee North Korea's security once the North denuclearizes," said Moon, the only global leader to have met both U.S. President Donald Trump and North Korean leader Kim Jong-un over the past week. Moon's remarks apparently shed light on the recent resumption of harsh rhetoric against the U.S. from Pyongyang that earlier prompted Trump to call off the first-ever U.S.-North Korea summit, previously scheduled to be held in Singapore. In an open letter to the North Korean leader released Thursday, Trump said it seemed inappropriate to hold the scheduled summit on June 12 due to the North's tremendous anger and hostility toward the U.S., also raising questions about Pyongyang's commitment to complete denuclearization declared at the Moon-Kim summit last month. The U.S.' doubts over the North's sincerity may have been warranted by the fact that North has repeatedly reneged on its promise to give up its nuclear development. 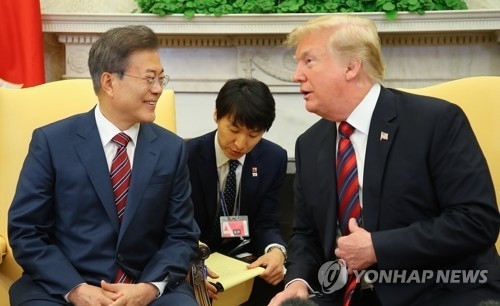 Moon earlier expressed his regret and frustration at Trump's withdrawal, which came just after he returned from Washington where he held a summit with Trump. "I am very perplexed, and it is very regrettable that the North Korea-U.S. summit will not be held on June 12 when it was scheduled to be held," Moon said in a written statement released by his office Cheong Wa Dae only hours after Trump called off his scheduled meeting with Kim. "I hope (the countries) will resolve such issues through more direct and close dialogue between their leaders," he had said. Apparently having learned the uncertainties held each by the United States and North Korea through his recent dialogue with their leaders, Moon reiterated the need for direct talks between the U.S. and North Korean leaders to put an end to the ongoing impasse. "As both Chairman Kim and President Trump sincerely wish for the success of the North-U.S. summit, I stressed the need for the two sides to remove any misunderstanding through direct communication and to hold enough dialogue on agenda issues that need to be addressed at their summit," he said Sunday. Moon reassured the North Korean leader in their latest talks that the U.S. is in fact willing to end its hostile relationship with the North should the latter abandon its nuclear ambitions. "While explaining the outcome of my summit with U.S. President Trump held last week, I relayed the message that President Trump is firmly willing to end his country's hostile relationship with North Korea and enhance economic cooperation should Chairman Kim make a decision on complete denuclearization and implements it," he told the press conference. The ball has now apparently been returned to the U.S. side as the South Korean president said Kim has clearly reaffirmed his commitment to complete denuclearization. Trump said he was looking at the possibility of still holding the Kim summit in Singapore on June 12. "We're looking at June 12th in Singapore," he was quoted as telling reporters in Washington. "That hasn't changed. And it's moving along pretty well, so we'll see what happens."